I used to get really annoyed at people who complained about their pregnancy. After having multiple losses, I would have given anything to be having those complaints. I felt they should just be grateful for being pregnant with a healthy baby. But with this pregnancy, I’ve learned that it’s true what they say, that each pregnancy gets progressively harder on your body. And that complaining doesn’t mean you aren’t grateful for the pregnancy or the baby or that you will love them any less. It’s okay to complain. With my son, which was my first pregnancy, I had it pretty easy. It may have taken a while to finally get pregnant, but I had no morning sickness or other major issues. Just the normal heartburn and swelling that comes at the end. With our angel daughter, the pregnancy was a bit harder. Still no throwing up, but I did have bouts of nausea and food aversions. I also had my first run in with sciatic pain. But still, I had suffered a chemical pregnancy and a miscarriage before this pregnancy, so was just so grateful to finally be pregnant. When we were hit with the hard news about our daughter, I tried to complain even less. What I was physically feeling seemed secondary to the issues my daughter was facing and I was completely focused on doing what I could for her. Now, with this third pregnancy, it has definitely been more physically tolling than the other two. The sciatic pain hit earlier and harder and the lack of sleep hit early as well. I can’t remember the last time I had a good night’s sleep because there is always something waking me up. If it’s not my legs hurting that wake me up, it’s my son who hasn’t been sleeping well, or even my husband’s coworkers calling in the middle of the night (why??). The swelling in my feet also started this past week, which is earlier than my other pregnancies. My shoes don’t fit anymore and I also somehow seemed to have hurt the top of my foot. So basically, this pregnancy is much harder than the other two. At first I felt guilty complaining because I didn’t want to seem ungrateful for this baby or this pregnancy. I truly do enjoy being pregnant, but that doesn’t mean it’s always easy or fun. It definitely is not stress or anxiety free. And just because it isn’t easy or I don’t enjoy every single moment of it doesn’t mean I don’t love and want this baby or that I am not grateful for the chance to be pregnant. It just means I am human, like everyone else. Being pregnant is definitely a sacrifice of your body and physical comfort. I certainly can’t wait to be able to have a drink again or to be able to sleep on my stomach. 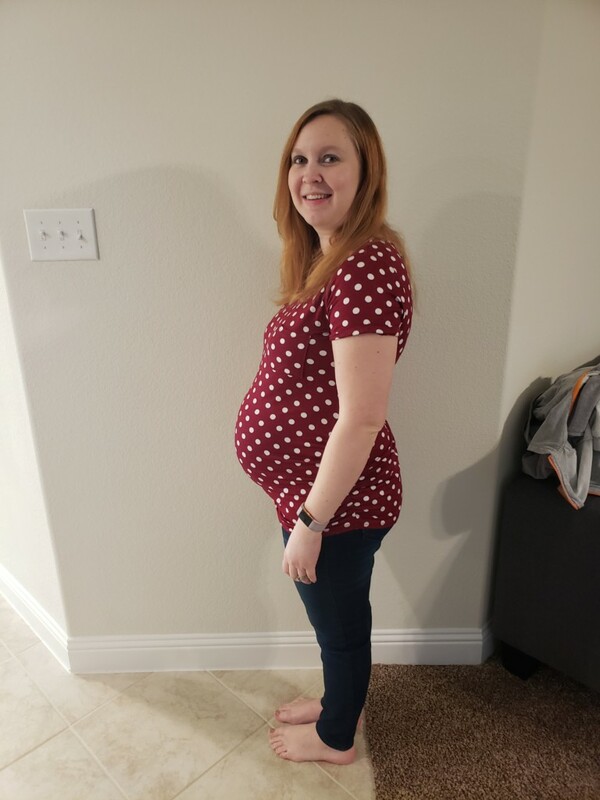 Despite the physical discomfort, I am still grateful for this pregnancy and I don’t feel the need to justify it to myself anymore. It’s okay to complain. And I know it doesn’t bother me as much when other women, especially those who haven’t had a loss or haven’t had trouble getting pregnant, complain. Because pregnancy is just hard, both emotionally and physically. It’s especially more tiring when you have a four, almost five, year old at home that is very active. I have mentioned before that I was kind of sad about how far apart the two would be, at five years age difference. Lately I have been thinking about how this is good in a lot of ways though. I won’t have to pay double daycare and I have one that is already potty trained and can do some things independently. Plus, I think they are still close enough to play with each other, at least when they are young. And hopefully my son will want to help out some so he can be involved. He was asking a lot of questions this morning about her being born. It is nice that he is showing interest. Even though this pregnancy may be more difficult, I am going to enjoy all of the moments I can. I am going to enjoy eating my cinnamon toast crunch to satisfy my craving and prop my feet up to keep them from swelling as much as I can. And be a bit excited that I am one week away from officially being in the third trimester.